Where can I learn more about the debuggers DDD uses? 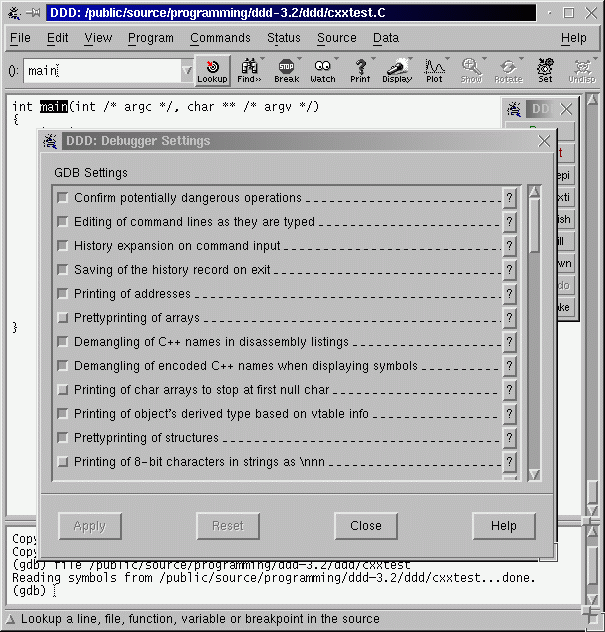 GNU DDD is a graphical front-end for command-line debuggers such as GDB, DBX, WDB, Ladebug, JDB, XDB, the Perl debugger, the bash debugger bashdb, the GNU Make debugger remake, or the Python debugger pydb. 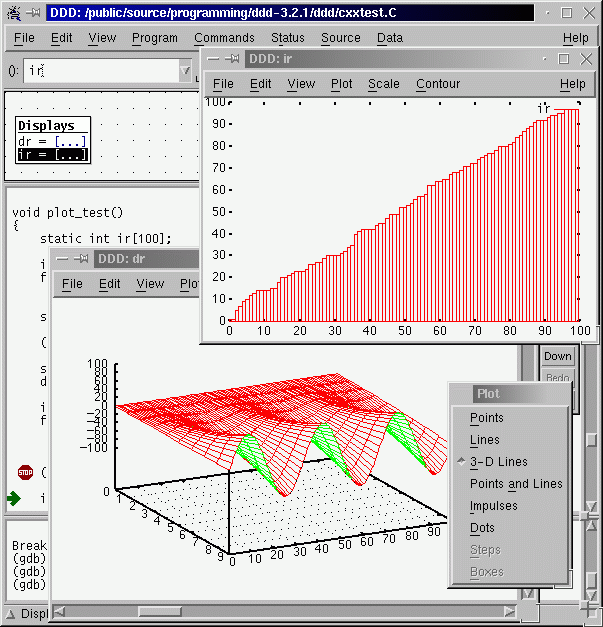 Besides ``usual'' front-end features such as viewing source texts, DDD has become famous through its interactive graphical data display, where data structures are displayed as graphs. For more information (and more screenshots), see the DDD Manual. (2013/01/18) Shaunak Saha is the new maintainer of DDD. (2009/02/11) DDD 3.3.12 is now available from ftp.gnu.org. DDD 3.3.12 features much improved support for debugging Python, Bash and Make, as well as various bug fixes. (2008/11/07) Release candidate 3.3.12-rc1 is available. DDD can now be used effectively to debug Python, Bash and Makefiles. You can grab the new release candidate from alpha.gnu.org. The source tarball is signed with the maintainer's GPG public key, which you can download from Savannah. (2008/10/22) DDD has a bug tracker on Savannah. The bug tracker is the best way to report bugs (use "Bugs" on the toolbar, and "Submit"). You are encouraged to login, but you can post bug anonymously if you want. Posting directly to the bug-ddd mailing list is now deprecated, since the tracker is a much more powerful way to organise the information. Please follow the instructions for bug reporting. (2008/10/19) Jose Maria Gomez Vergara has handed maintainership of DDD to Peter Wainwright. Where do I get DDD source? the DDD manual in TeXinfo, Info, PostScript, and PDF formats. Here are further instructions on how to download and unpack GNU packages. You can support the principle of software freedom by buying stuff from the FSF shop. Where do I get DDD binaries? The FSF does not distribute DDD binaries. You can ask for help if you need technical support. DDD packages for Debian GNU/Linux are found here. DDD RPMs can be found in https://rpmfind.net/linux/rpm2html/search.php?query=ddd. The written word provides binaries of freely available software for various platforms. Their FTP server contains DDD and XPM packages. What do I need to build DDD? The DDD source distribution (see above). 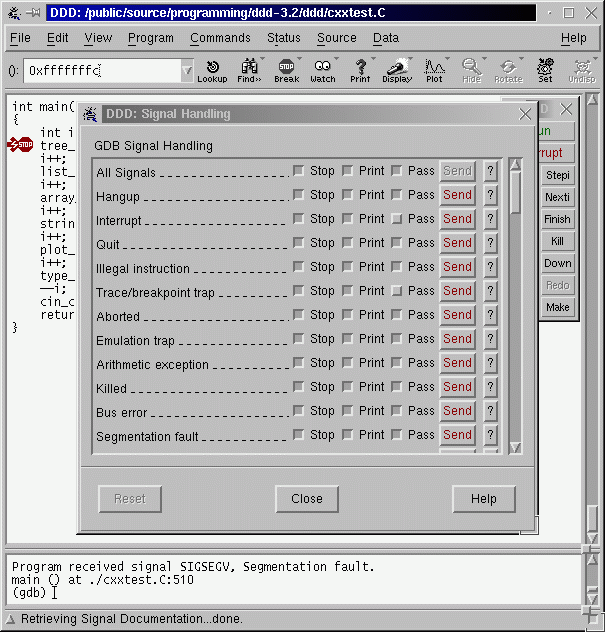 The GNU compiler collection (GCC), version 3.0 or higher (or another ISO C++ compiler). The LessTif user interface toolkit, version 0.89 or higher (or another Motif-compatible user interface toolkit). How do I get started with DDD? The DDD Manual contains a detailed tutorial. There's an article on DDD in Dr. Dobb's Journal. Linux Magazin has articles (in German) on debugging with GDB and DDD. LinuxFocus has a DDD tutorial in English, Spanish, German, French, Korean, and Turkish. Where do I get DDD alpha releases? The DDD Subversion repository (containing all versions of DDD, including the very latest changes) is available via https://savannah.gnu.org/projects/ddd. I have found a bug! How do I report it? Please try to see whether your bug has already been reported. You can browse or search the bug tracker. Please read the section ``Bugs and How to Report Them'' toward the end of the DDD Manual. Be sure to include a copy of your ~/.ddd/log file which tells your DDD configuration as well as the interaction between DDD and the underlying command-line debugger. Remember, the more (relevant) information you put in your bug report, the more likely it is to be fixed rapidly. The purpose of reporting a bug is to enable the bug to be fixed for the sake of the whole community of users. You may or may not receive a response; the maintainers will send one if that helps them find or verify a fix. Most GNU maintainers are volunteers and all are overworked; they don't have time to help individuals and still fix the bugs and make the improvements that everyone wants. If you want help for yourself in particular, you may have to hire someone for technical support. If you are willing to help fixing DDD bugs, you can subscribe to the bug-ddd mailing list or access its archives. I have a question regarding DDD. Where do I get assistance? We have a general-purpose mailing list devoted to DDD. You can ask any questions to ddd at gnu.org. Patches and new releases are also announced here. Subscription info and mailing list archives are available. Owing to abuse by spammers, it is necessary to subscribe before posting to the list. If you need technical support on DDD, you can ask for technical support. Where can I learn more about debugging and debuggers? LessTif or Open Motif . A window library needed to compile DDD. HP Wildebeest (WDB) . A port of GDB to PA-RISC/HP-UX, by HP. Insight . A very nice GUI for GDB from Redhat, the GDB maintainers. KDbg . A KDE-based GDB Interface with inspection of variable values in a tree structure. xxgdb . The oldest and simplest X interface for GDB and DBX. tgdb . 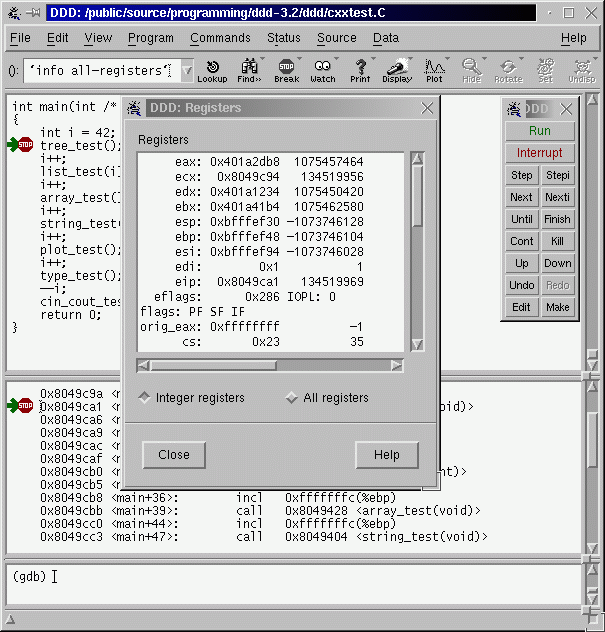 A Tcl/Tk GDB interface (similar to Turbo Debugger or CodeView). deet . A simple and extensible graphical debugger. A list of available Perl debuggers . The ultimate Perl reference. A GUI for the Perl Debugger . Written in Perl. GNU Nana . Improved support for assertions and logging in C and C++. xwpe . 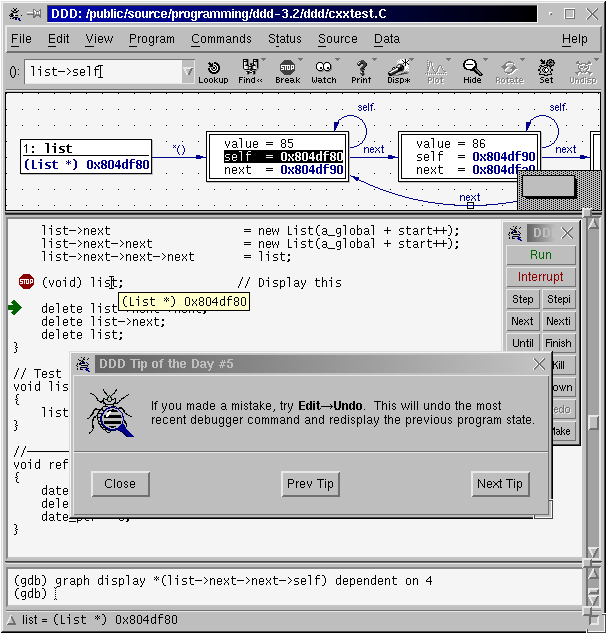 A programming environment integrating a program editor with an external debugger. Valgrind . No-one developing C or C++ code under Linux/x86 or Linux/PPC should be without it. Please send FSF & GNU inquiries & questions to gnu at gnu.org. There are also other ways to contact the FSF. Please send comments on these web pages to bug-ddd at gnu.org.